In vitro stimulation of mixtures of T-cells and macrophages/-dendritic cells with either antigen or mitogen results in the production of a variety of mediators involved in lymphocyte activation. Supernatants (Sn) of such cultures have been used for many years as a rich source of nonantigen-specific helper factors for both B-cell- and T-cell- responses (1–5). Interleukin-2 (I1-2), a factor with a mol. wt. of approximately 30 000, has been identified as a major constituent of such Sn (6–9). 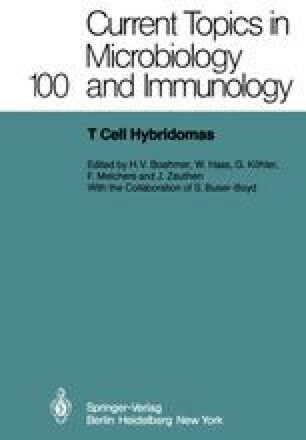 The characteristic feature of I1-2 is its capacity to promote T-cell growth. In addition, other biological activities were also found in I1-2-rich preparations of ConA-stimulated mouse spleen cells including B-cell stimulatory activity as well as maturation and differentiation of both pre-T-cells and thymocytes into cytotoxic effector T-cells (9–14). Because these activities copurified under conventional separation procedures, it was suggested that I1-2 is critically involved in all these processes. However, whether or not I1-2 is the only mediator remained unclear. Thus, it is conceivable that other, so far unidentified factor(s) of a similar biochemical nature contaminate the I1-2 preparations even when vigorous separation procedures are applied. These putative factor (s) may, either by themselves or synergistic with I1-2, be responsible for the distinct biological activities detected in different assay systems.